This year’s St Neot’s Regatta saw us pick up two wins on both days, continuing our winning run nicely. These came from a variety of sources, again showing the increasing breadth of competitive crews in the club. Our winners in the 1,000m races on Saturday were the new pairing of Tom and Mike, sculling at IM2x- and a ladies Quad of Liz, Andi, Sam and Lindy, racing at IM2 (with Sam de-novicing at sculling). Sunday’s 500m winners were the highly impressive juniors John and Alex, winning the IM3 event (Alex de-novicing at just 16!) and the mixed eight of Benn, Mike, Tim, Tom, Liz, Andi, Lindy and Jo. With too many races to remember (and me being very busy) this entry won’t have the usual details of every race. Instead, I’ll just pick out some of the outstanding memories of (another) great week-end at St Neots. Saturday didn’t actually start very auspicially. One of the first boats out was the double of John and Alex, rowing as J18. Their opponents appeared round the corner at the allocated race time, but no sign of them. Several races later, they came into view, but with only John sculling. As they passed us the reason became clear, as Alex was sitting nursing one complete blade and one in two pieces. He’d caught a crab off the start, the blade flicked under the boat and when he tried to free it, it snapped. Strangely enough, John then had an almost identical problem in his single later in the day. This time though he went for the soft option and simply rolled in to the water. To his great credit, his opponent agreed to a re-row even though this wasn’t required, so well done to him. Following the theme, John wasn’t to be the last soggy junior of the day – Roisin also got in on the act, this time just before the finish, in full view of the crowd. To her credit, she did exceptionally well to tow her boat clear of the course, well before the next race got to her. The rest of the racing didn’t produce quite so much drama, although there were some incredibly close races. I had the honour of coxing one of these, the Men’s Novice 4+; after a slow start, our opponents pulled out to pretty much a two length lead around the bend but to their credit, our guys really went for it. A couple of strong pushes seemed to panic the other crew and by the finish line we were (as the commentator kept putting it) bowball—to bowball. We honestly didn’t know who had got it but the verdict finally came that our opponents had taken the win, by a bowball! A bit of work on the starts and this crew won’t be novices for long! After a good day’s racing, we all retired to the MKRC “village” and set in for a very pleasant evening gathered around the Barbie, with the odd beer or two thrown in. Sunday saw another day of close, exciting racing but pride of place has to go to John and Alex. Recovering from their broken blade incident yesterday, they cruised through the first two rounds, sculling at IM3 rather than Junior, to set up a final against ??. This they made look easy, pulling away off the start and striding out to a comfortable win. The Mixed Eight had a relatively easy first round win, putting them into a final against hosts St. Neots. This was a far closer event, although our boat grabbed the lead and held on, St Neots pushed them really hard all the way, finishing just half a length down. Another wonderful week-end at St Neots. I love the atmosphere and the proximity of the spectators to the racing – and some really close hard races on both days. It was nice to see they’ve taken a more relaxed view on campers and barbies this year and restricting them to the far side of the path is a really smart move too. I guess the only gripe is that our original entries were seriously cut back, through lack of competition. This meant Lou and Clare not getting any races and Paula just getting the one. Although I understand this is lack of other crews, how about closing entries a few days earlier, notifying the clubs that have had crews rejected and allowing them to rejig and resubmit crews into categories where there is competition? This way, our crews get a race and the host club gets more money – surely a “win-win”? Another good day out at Bedford saw us come away with another three wins. These were nicely spread out with the Men winning the IM3 4x-, the Women the IM2 4+ and the Juniors (making a welcome return) winning the IM3 2x-. Some very close races, both in winning and losing and most crews at least making it through the first round. In their first race outside of Milton Keynes, Phillip and Alex acquitted themselves extremely well, winning their first race (against Star Club) with an “easily” verdict. In the next round they faced a strong (and eventual winning) boat from Northampton and lost by a similar verdict. Two of the “Juniors” were out in this category, John and Ryan. After a first round row over, they faced Globe in the semi-final. An assured row saw them win by 3 1/2 lengths to put them into the final against Poplar Blackwall & District. This looked like a tough draw as this crew, although not the most technical, were huge. Indeed, the final turned out to be a really hard race, pretty much neck and neck for much of the course, but John and Ryan’s technique and power paid off and the came through to win by 1/3 length. Very nice to see the Juniors racing again and even better to kick it off with a win. Lainy and Roisin put up a good race against a Dame Alice double and pushed them hard all the way, but lost out by just 1 1/2 lengths. A heart breaking result for Lainy in her single. Having fought hard against the Sudbury girl all down the course she lost out by just one foot! Can’t get much closer than that over a 600m course; a tough result and a horrid way to lose. This was all from the juniors – one win and some very encouraging races from the others, especially poor Lainy. Still, a good sign and hopefully a pointer of greater things to come. A slightly different line up to that at East Midlands, with Lou swapping in for the absent Karen with Paula, Alice and Clare making up the crew. With the crew still being fairly new to sculling and with Clare still learning the art of steering, not surprisingly they lost out in their first race to Star Club, by 3 lengths. Pierre-Yves and Steve swapped sculling blades for sweep and were out in the pair. Racing as a Masters C crew, their first opponents were a “D” crew from Star Club;this meant Steve and Pierre-Yves starting six seconds behind. From an absolutely storming start, the two of them pulled back the handicap start within the first couple of hundred meters and were then able to “sit” on the Star boat for a comfortable finish, 3/4 length clear. The final was the same handicap, this time against a Peterborough boat. This was to be a much harder race, with our guys pulling back the handicap fairly quickly but then fighting neck and neck down the course. Coming towards the end, Steve was cutting the line fine to gain a slight edge but, unfortunately, cut it a bit to close to Monkey Island and clipped the bank. This lost them precious seconds and the Peterborough boat pushed over the line to win by a length and a half. A real case of “what might have been” especially as we heard the Peterborough crew rowing back say that they’d have lost had Steve and Pierre-Yves not clipped. For the first round our crew (of Mike, Josh, Nelson and Tom) faced a Northampton boat. With this being a new combination and Tom steering his first quad race, it could have gone any way. As it happens, the first round was a fairly comfortable run, beating Northampton by three lengths. Into the final, they were against a Medway Towns crew who had comprehensively beaten Star Club in their first race, so this looked like a tough draw. So it proved – there was nothing to choose between the two crews all down the course, with the lead swapping back and forth. Come the finish line, neither crew knew who had won – not surprisingly as the verdict was a win for MK by a mere three feet! Not a bad way for Tom and Nelson to de-novice either. For a pleasant change, we found we were the older crew in this event and had a five second handicap in our favour – I think this is the first time I’ve had this! This was a reprise of our National Masters boat, but with Pierre-Yves and I swapping sides to try and improve the balance and power. This certainly worked off the start with a really good, strong hard push away. Despite the quickest five seconds I’ve ever heard, we had enough to keep the Sudbury boat behind us, being able to (just) match their pushes. All down the course they were eating into our lead and by the time we crossed the line, although we thought we’d done enough, we weren’t sure and had to call over to the finish marshal to get confirmation – we’d won by a canvas. The final was a bit of a shock – we’d seen in the draw that our opponents, X-Press, were again a “B” crew to our “C” and expected a similar head start. However, on the start line the start umpire called that we were both “C” and so there would be no handicap – a bit of a psychological blow, certainly for me! Anyhow, although we put in another really good start, so did X-Press and we were soon trailing , albeit just slightly. They proved to be just that bit quicker than us though and gradually eked out a lead, to finish a length clear. Despite this, we felt this was a good race, and maybe the exertions from Steve and Pierre-Yves in the pair and our having to fight through the first round (X-Press had a bye to the final) may have just made the difference. A word for our cox here – David came all the way over to Bedford just to cox our boat, having no races of his own. He did a first class job and coxed really well – thank you, it was really appreciated! Although this crew hadn’t actually raced together, they had all raced in various combinations in the past and looked a strong boat. It comprised Charlene, back from a rest, with Lindy, Jo and Paula backing her up. From the start they pushed away from St Neots and just eased away from there. Already a couple of lengths clear approaching the finish, the St Neots boat also clipped Monkey Island (quite an achievement for a bow loader cox!) making it into a comfortable 3 1/2 lengths win. Nice for the girls, especially given that they were lugging an 85 kilo cox down the course (Benn is not what you’d call natural coxing material) but a shame that again they pick up racing points off of a straight final that they’ve won easily. A second race of the day for Mike, John and Josh with Benn in his first outing. This was a straight final, against Peterborough, with our crew unable to get ahead and finishing some 1 1/4 lengths adrift. Originally planned to be a racing début for Roger (at 70+!) he unfortunately twinged his back the previous day. Needing another “Master” to fill in and finding the rest of us “old boys” were in clashing events, Paula very gamely agreed to sit in with Benn. As this was their first outingever, they were up against two huge Norwich guys AND they had the handicap against them, the result wasn’t overly surprising! A good paddle nonetheless, although the “easily” verdict wasn’t unexpected. Not quite sure what went wrong with the weather – maybe the sacrifice wasn’t enough this time – as it was grey, cool and occasionally wet. Still, despite this it was another well run event, although (unusually for Bedford) there were a couple of glitches, mainly having to stop racing to sort out the marker buoys. My biggest worry is that, yet again, entries seemed well down; this manifested itself in a number of ways. First, we had a couple of crews scratched with no competition, second, most of the races were straight finals and lastly the usual steady flow of races we normally see at Bedford was a bit staccato. I really think someone at British Rowing needs to start looking at this as, if this trend continues, we’ll start losing events off the calendar as they become non-viable (unless that is the intention?). Although there may be a financial aspect to this the general consensus seems to be the points regime is scaring people from entering races. The biggest shame is that this is the last “Quarts” event – I guess the cost of these has become excessive but no more will we race for those magnificent 2-pint pots. Tragically, I never won one – made all the worse by wife and daughter celebrating their gallons, having won their fourth Quarts pot today. A simply stunning day at the British Masters was crowned by our Womens Masters B 4- boat taking the Gold Medal! The top result of a top day that also saw Tim and Benn take Silver in the Masters A IM3 2x-. We also had a number of other second and third places but where these had limited entries, didn’t medal. I’m pretty sure this is Milton Keynes’ first ever national title, a real day to be proud of racing for the club. Huge congratulations to the winning ladies, Liz Tatman, Helen Jones, Paula Heywood and Andi Grossey. This was a great end to the day, and somehow all the cold and wet misery from the incessant, pouring rain just evaporated as the ladies stormed their way to the line. Strangely enough, the day started bright and sunny, although a bit chilly for the group of us who had camped over. After a reasonably leisurely start to the day (except Tim and Benn who went for a warm up on the Trent) and bacon butties on the barbie, it was time to get racing heads on. We fairly soon saw the advantages of arriving yesterday for the East Midlands Regatta, as we had a prime position in the near trailer park (unlike last year, where we had to carry boats what seemed like several miles). With a number of new combinations and unknown competition, we had no real idea what to expect; just an expectation that we’d move up a step from last year. First crew out were Tim and Benn, picking it up from their splendid win at the previous day’s East Midlands Regatta. Facing a tough looking draw against Dart Totnes, Bradford and Nottingham, they were soon fighting it out for the lead against the Dart Totnes boat. A very close, hard race finally saw Dart Totnes cross the line first with Tim and Benn picking up a well deserved Silver Medal for second place, with four boats in the category. Next to go were Liz and Andi, sculling in the A Open category. In their heat, as one boat had scratched, all five crews would proceed to the final; against two boats apiece fro Nottingham and Warwick, they were content to watch the others and do enough to settle for third place (although the competitive streak kicked in with a few hundred meters to go – no way were they going to be fourth!). The final saw them line up against the same opponents, with an extra crew from Cambridge 99s added in. From the heat, they were aware that the two Nottingham boats were going to be very quick, and this proved the case in the final as well. With these two surging into the lead, Liz and Andi were left in a fight for third place. Although down slightly at the halfway stage, they were able to ratchet up the power and drive through, to take third place. As there were only six boats in the event, this wasn’t enough to land them a medal, but they were still (justifiably) very pleased with their race and placing. Following the win by the Novice Quad yesterday, this pushed Clare up from Novice to IM3 level in the single. At this stage, this was probably a step too far and she finished last of three, a long way off the pace. Although Steve and I got a fairly good start in the double and were able to hang on to the Champions of the Thames boat for the first 250m, the others had long gone and then Champs also pulled away. A bit of a reprise of the races at Peterborough and confirmation that we need to stick to club events rather than top level championship competitions where we are way outclassed. Around about now, the rain that had been threatening all morning drifted in. Light at first, it gradually picked up and we were in for a very wet day. This was a re-run for the boat that performed so well at Peterborough last week, with Paula, Helen, Karen and Lou, coxed by Liz. In a big final, with Tees, Hereford, Ross, Llandaff and St. Neots, the only known opposition was the St. Neots boat, whom they’d beaten easily at Peterborough. From the start, the race split into three separate clashes, with Tees and Hereford breaking into the lead, MK and Ross slugging it out for 3rd and 4th and Llandaff and St. Neots trailing. At the 500m mark there was under half a length between our ladies and Ross (with us just shading it); from here to the line it was a really hard fight, with Ross pushing and our boat countering; we had enough to hang on, and crossed the line in a highly commendable third place, with Hereford taking first and Tees second. Again, not a medal position but a really good performance again from the ladies. OK, what happened in the lead up to this race is the sort of thing to go down in club history. With the rain driving in now, everyone was taking shelter and putting kit in cars to keep it dry. Add to this the frantic chasing around after various crews and when we came to boat, we couldn’t find a cox box. With no signs of any in the trailer and Oundle’s spare not working, we had no choice but to boat without Paula having a cox box. Bearing in mind she’s only just recovered from having a polyp on her vocal chords removed (caused by shouting too much when coxing!) this was not a good thing. Still, the four of us (Steve, Iain, Pierre-Yves and I) got into the boat and set off up the course, with Paula calling as best she could. This was fine on the row up, but we were a little concerned as to what would happen in the race, with far higher background noise. Passing the 500m mark on the way up, we passed Tim who was walking back to the start, having watched Andi and Liz start the previous race. We called over that we didn’t have a cox box but were managing – he had other ideas. We carried on rowing up to the start, tried a practise start (usual pull to bow side) and sat around waiting to be called forward. Then we saw Tim running back up towards us – he’d run from the 500m point all the way down the course, through the boating area, trailer park and across to the camp site to his car, picked up a cox box and run all the way back (this time with an extra 500m). By my reckoning, that must have been around a 3 to 3.5 kilometre run! However, he was on the bank and we were out on the lake, but that wasn’t going to deter him. Starting to roll up his trousers (before he realised there was no point) he started wading out into the lake; despite us yelling at him not to worry, he just kept coming, up to his midriff and across to our boat. Calmly handing the cox box to Paula, he then waded back to the bank, leaving us utterly speechless and fully cox boxed up. This really was way beyond the call of duty, done because he was worried about Paula’s voice – Tim you’re a star! So to the race. We were against two other clubs, Maidstone Invicta and Derby and again had no idea how we’d fare (after all, the race yesterday was our first one together). Off the start, we again pulled to bow side and this, together with an increasing crosswind, nearly put us into Maidstone’s lane. A great bit of coxing by Paula pulled us back straight and central in our lane but this had cost us a couple of lengths on Maidstone and the best part of a length on Derby. From here it was just a hard, hard slog. Gradually we pulled back on Derby, first to overlap and then level – by the halfway point, the timings show 1/10th of a second difference with us just getting our noses in front. Maidstone were still a good length clear but Paula called that we were catching them. With Derby pushing really hard behind and us putting everything into catching Maidstone, this was turning into a seriously hard race. In the end, Maidstone eased out a bit more to finish just over a length clear, but we hung on and slightly increased our advantage over Derby, to take second place, by a second and a half. Pierre-Yves swapped his rowing blades for sculling ones and was next up in a single. Having to row at “A” instead of “B” put him against much younger opponents and this, together with the exertions in the four, left him well behind trailing in behind the other two boats from Dart Tones and Furnivall. The win by the Novice Quad yesterday had a knock-on effect to today. As the Novice boat included Paula, Karen and Clare they could no longer race Novice today (this rather upset Oundle who were the only other Novice Quad at “C” – they got a row over and Gold medals, but felt it was a bit pointless) and had to switch to IM3. This also left Paula with just 30 minutes between races. Lou made up the crew, switching in for Alice. Drawn against crews from Falcon, Monmouth and Sudbury, they kept with the other crews from the start but the greater experience (bearing in mind this was only about the third or fourth outing in this combination) of the other crews started to tell and our ladies dropped off the pace slightly, finishing last but with another encouraging scull. A succesful piece of steering by Clare, still learning the ropes too. With Paula hopping straight out of the quad and into the coxless four and with very little practice (if any) in this boat, we didn’t know what to expect; having said that, the four of Liz, Helen, Paula and Andi looked strong on paper. Their only opponents in this straight final (our last and very nearly the last race of the day) were a strong looking crew from Norwich. With visibility really hampered for us spectators by the torrential rain, it was very hard to see what was happening. As the two boats approached halfway, it was almost impossible to tell who was leading – heart said us, head said can’t be sure! Getting closer it became apparent that there was nothing to choose between them (the official timings shows MKRC leading at 500m by 0.4 seconds!). In a real scrap, gradually our ladies inched ahead until over the last 100m they started to widen the gap. The noise from our club members was deafening by this time as we could see them pushing and pushing, stealing away from Norwich. This last huge push was enough and they crossed the line a length clear, taking MKRC’s first gold medal at any national event. It’s hard to put into words just how proud we all were of them, so delighted at this little bit of history. 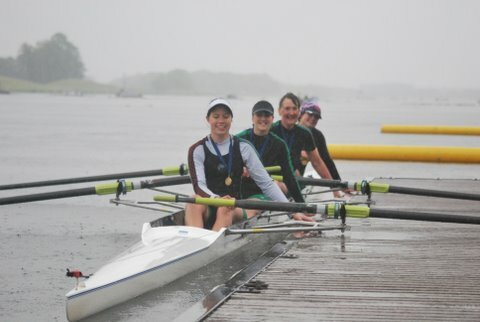 With the rain bucketing down, they spun and headed for the presentation pontoon – clearly oblivious to the conditions by now, they rowed over to collect the coveted gold medals, just such a magic moment. Brilliantly well done to them all. After this, it was back to the boating area and time to pack up but with all of us absolutely buzzing. One of those “had to be there” moments. Another great event for the club, culminating with that amazing win. Some other outstanding performances, with Tim and Benn collecting their Silvers, other second and third places. A big mention to Iain – placing second after less than a year rowing (I remember going out in the tub and training four with him in freezing cold conditions with him just last winter!) is some going. The other stand out thing for me was how we work as a club. Whoever was boating or landing, there was always someone from the club there to help/congratulate/commiserate. Everyone mucks in and works with each other – in contrast to other clubs (for example, a double who’d won gold carrying their boat, blades and trestles back al on their own, a single sculler having to boat on her own). To me, this kind of makes us special, we’re in this for each other not just for personal glory. The key memories of the day have to be the ladies win, just so good, and Tim’s wading exploits, just so incredible. There’s special mention for Benn as well – not sure how far he ran during the day but he was always appearing, rushing off, collecting something, running back and reappearing. In between he also found time to shoot some great video (see link below). A special day for the club but most importantly for the four ladies – well done Liz, Helen, Paula and Andi, we’re all proud of you! This event was a bit of a “voyage into the unknown”. Taking advantage of it being at Holme Pierrepont the day before British Masters, we decided it was worth a try. I think it was also the first East Midlands event, hosted by Derby, Loughborough, Nottingham and Newark, and it meant racing against clubs that we don’t normally encounter. As it happens this was a really good decision! Not only was it a really nice event but we took four wins setting us up nicely for the next day and continuing a superb winning run for the club. After the utter confusion caused by our deluge of wins last week-end with the attendant status changes, together with the event organisers shuffling events and boats to maximise the number of entries, we played a kind of “guess who” game. I arrived thinking I was in two events, the normal double and a mixed quad (more of that later). I was then a bit surprised when Iain arrived, as I fully expected him the following day for our Masters C 4+ but not today. Trying delicately to broach the subject of “aren’t you a day early?” I discovered we were racing the 4+ today as well!!! A similar double take happened with Paula when Karen arrived – Paula then found she was not in the one race she expected but three. All good fun and, to me anyway, showing the club cohesion and “can do” attitude, we just got on with it. After an unfortunate delay to the regatta start, while they rearranged the lanes (some were really wide while others were rather narrow!) we got underway; despite some grim weather forecasts during the week, it was bright and sunny with a moderate breeze blowing; pretty much as good as it gets at Nottingham! Not one but two singles out in this event, with John joining us from Row Caldecotte and Pierre-Yves making his first outing in a single outside our regatta. Pierre-Yves’ plans were thrown a bit into disarray as the car with the riggers for his boat arrived late (someone – and it would be cruel to say who… – overslept) but he blagged a nice Wintech from Nottingham. John was first out and cruised to second place to book a spot in the repêchage. Pierre-Yves followed suit and also made the rep. Unfortunately, there was some confusion over the timing of events following the delayed start and somehow both of them missed their start times for their races; a pity as this lost them the chance of a second race in their singles and a pop at the final. Still, they both had other events later in the day. This boat started out as a bit of fun, with the two couples (Paula and I, Steve and Clare) deciding to have a go. We’d had extensive (by MKRC standards) training (two outings) and these had gone really well, so we were hopeful of getting a good scull. We were entered at IM3 as no Masters event was available and were sitting by the start watching for our opposition, hoping it would be a similar kind of age. Various boats came up – masters, another masters, another masters and then up rocks a mixed quad of scary looking (i.e huge and young) kids. Yep, this was our opposition. A completely new line up for an IM3 quad, with John stroking, Tim and Benn providing the grunt and Pierre-Yves steering. Racing against two Nottingham and Union crews and one from Newark, this was a closely fought affair. After a really hard race, the Newark crew ran out winners, with us in second and the two N&U boats bringing up the rear, some distance down. Mainly to get some race practice ahead of the National Masters tomorrow, we put in the Masters C four, albeit racing at IM3 level. We’d never raced this combination (Steve stroking, Iain, Pierre-Yves and I, coxed by Paula) before, so had no real idea of how we’d fare. Lining up at the start, we were against three other boats; a Leicester Uni crew, and club boats from Loughborough and Trafford (spot the difference – their kit is identical to ours!). After a slight disagreement with one of the crews at the start as they tried to remove our bows, we settled and were ready. On “attention… go” we pulled quite violently to bow side and this put us a length down on the other boats straight away. Picking it up from here, we fairly quickly overhauled the Trafford boat and set about chasing Loughborough – the Leicester Uni kids had long since gone. Although all four boats would progress, the first two would go straight to the final and the second two to the rep, so we really wanted second spot. Inch by inch, we clawed back on Loughborough, gradually reeling them in and then, as we hit the 250m to go marker, pulled level. Paula called a big push and this surged us past them and we gently pulled away taking second spot by a length or so. A very pleasing race, especially given the start. So to the final. Here we lined up against not one but two Leicester Uni crews together with another Trafford boat. A similar start to the heat put us another length down and chasing. This time, we chased down the second Leicester Uni crew and passed them but the other two finished well clear. However, given how few races we’ve had together (and how few Iain has had period) we were really pleased with this one, finishing third in a pretty high calibre field wasn’t too shabby at all. With Sam from the Henley crew unavailable, Jo sat in for her, together with Andi, Ash and Lindy. A lack of water time together didn’t help their cause and they finished second to Newark (probably the boat that won at Peterborough last week?) but well ahead of Derby and Leicester Uni. Tim and Benn were next up, this time racing as a double, racing against Nottingham and Leicester. Given that this was only their second outing (they tried their first start on the way up to the start!) they weren’t sure what to expect. Despite this, from a good start, they pushed into an early lead and were a length up by the halfway point. From there, they eased away a little more, landing our first win by four seconds over the Nottingham crew. Not bad for a second outing. This event pitted Steve and I in a straight final against Lincoln. Straight from the off, we pushed into a lead and were able to extend this through the first 500m, to the point where we were able to sit on them quite comfortably. Despite hitting a massive sqall that near on stopped us in our tracks, we seemed to cope with the conditions in the second half much better and pulled away for our second win of the day. Personally, this was a real fillip after the misery at Peterborough last week. Mixing it up from the Ladies Masters quad of last week, this was a really scratch crew. With Paula stroking, Alice and Karen in the middle and Clare steering at bow, they had a straight final against Nottingham. The lack of practice together certainly didn’t show – easing into a slight lead from the start, they pushed away slowly but surely to a length clear by the halfway point. Despite some really hard battling from Nottingham, the girls dug in and held off their challenge, to finish a length clear for our third win, de-novicing into the bargain. By now we, were really buzzing as the last three MKRC boats had all won. Tim and Benn swapped sculls for sweep and set out (at IM1 level!) against Derby. This proved to be a fairly comfortable race, as the two finished off their day with our fourth and final win. Most of us who were racing at National Masters the following day had opted to camp over. We set up a little circle of tents on the camp site and settled in for another great evening. Gathered round the barbie, sharing a few beers (not too many in view of tomorrow – but there were pots to christen) and chatting, it made for another really great end to another brilliant day’s racing. I really liked this one. Not only was it (another) good day for the club but it was just nice. There were some really good touches, such as ensuring anyone in an event with heats got at least two rows (going either to the final or to a repêchage) and the presenting of pots while in the boat. First time I’ve had this and it made it feel really special. The whole atmosphere was chilled and especially the umpires – never had such polite, friendly and chatty people controlling a regatta. Holding it at a major facility and having (for Nottingham) pretty good weather obviously helped but I do hope they do the same next year. This was a great warm up event for the Masters the following day. My favourite comment of the day came from one of the Duke of Edinburgh volunteers (they were really great by the way) – it was along the lines of “I’ve learnt the colours for Leicester and Milton Keynes today – they’re the ones winning everything”! Nice to know we’ve made an impact. Please note the views in this blog are my personal ones and do not reflect the official view of Milton Keynes Rowing Club. If you disagree with anything here, please use the comments section to discuss, rather than going to the club. What a week-end! After some really low points on Saturday, everything turned around on Sunday and it became our most successful Peterborough Regatta ever. So much so that, despite being a “small” club, we placed third overall in terms of club wins, with no less than six victories, one on Saturday and five on Sunday. This featured some really strong performances, especially considering the conditions. Both days had extremely high winds blowing almost straight down the course, making it very hard going and causing real problems for crews getting onto the stake boats. We also camped overnight and had a really good evening, helped by finding a secluded camping area and making into “mini-MK” for the night. Good food, good drinks and good company – obviously a recipe for success, looking at the Sunday results! A bright start to the day, but strong winds blowing as we headed up to Peterborough. Quite a good turn out of crews, across both Men’s and Women’s squads. Entries seem down on previous years as the trailer park wasn’t as jammed as we’ve seen it and the car park didn’t extend beyond the spectator line. We set up camp and then settled in by the finish line to watch the day’s racing. No idea what to expect from this boat, as it was a completely scratch crew, comprising Helen, Liz, Alice and Sam, with Tim coxing. In their heat they put in a solid row to finish second behind X-Press, good enough to see them into the repêchage. They felt there was more to come and so it proved, with a storming win in the repêchage to put them into the final. Knowing they needed to find yet more, they started fast, pushed into the lead and held off a determined fight back from the other crews to pull away and take the win. A really great set of races, and wonderful to see both Alice and Sam de-novice, especially at a top event and in such atrocious weather conditions. A bit of a shock though to find they all copped for two rowing points as there were more than eight boats in the event! One side effect of the W.IM3 4+ boat getting to the repêchage was that this led to a crew clash with Helen being in that boat and the Masters 4+ which was scheduled eight minutes later. Despite Tim’s shuttle mission between the other crews and Race Control, this proved impossible, so they were left with trying to get Helen swapped and back up the course as quickly as possible. In the event, despite a rapid change of crew and a frantic row back up the course, having told all the marshals what was happening, as the ladies got to the 250m meter mark, their race was started without them as they weren’t at the start at the correct time. It’s hard to put into words just how upsetting this was; had it been them just boating late, fair enough but when we’d done everything to inform everyone and the crew were so close to the start, it seems unreasonable. This was made even more galling when our double was held up and raced out of sequence – to accommodate another crew who had had a crew clash. The heat saw Steve and I against Champs, Ardingly and Oundle. Knowing the first three went through, our aim was to try and sit on Oundle and make sure we led them. We had a good start and were up with Champs and Ardingly for the first couple of hundred meters and this put us clear of Oundle and allowed us to take it down a bit and just watch them through to the end, to put us into the final. The final was clearly going to be a massive challenge, pitting us against Champs, Ardingly and Poplar, all of whom have beaten us easily. Sculling in the worst conditions I’ve ever raced in, I struggled badly and we were dropped off very quickly, with (not surprisingly) Poplar winning comfortably and the other crews well ahead of us. Mike and Nelson reprising their boat from our Regatta, up against two Peterborough crews and one from Newark. Considering the conditions and their lack of water time together, they did really well, holding on to the other crews pretty well but unable to make it through to the final. A new look crew of Mike, Tim, Josh and Nelson were pitted against a strong line up of UEA, Peterborough and a composite from various London Unis. Another close race but the others were a bit too good and our guys finished in the tail end spot. A first outing for a Women’s Masters quad, with Paula, Lou, Clare and Karen. As with virtually every race, there were problems getting attached to the stake boats, as soon as one got attached, another would drift round. Eventually, all four crews were (sort of) aligned and the race started, Being a mixed (B/C) event, our ladies were off first but a big squall pushed them off course and into Star Club’s lane. This resulted in the race being halted and our crew being disqualified; a very bad day at the races for Paula, Lou and Karen who’d been in the W.Masters B/C 4+ boat earlier. Our last (and very nearly THE last) race of the day saw Tim, Josh, Steve and I out in the quad, for the first time since the same event last year (well, you can over practice…). Drawn against Royal Chester, Peterborough and Rob Roy, we got a storming start with us and Rob’s pulling out into the lead. Suddenly, there was a lurch and I realised that Josh, in front of me, seemed to have had a problem. I then noticed he wasn’t on his seat but on the decking – in a quite amazing feat of gymnastics, he managed to hop himself up, onto the seat and pick up, all without missing a stroke although he then nearly pulled a crab. This had dropped us at least a length and a half off of the leaders and back level with Royal Chester. Digging very deep we wound up the pace and ate into Rob’s lead. Unfortunately, we ran out of lake and despite all our efforts lost out – but by just half a length! So ended a really frustrating day of racing. We were all upset over the treatment of the Women’s Masters Boat and the inconsistency of how the rules were applied. The conditions were dreadful, strong winds making any manoeuvring at the start really difficult, although all credit to our coxes and steers people who seemed to cope better than most. Having said that, some of the coxing was simply woeful, with coxes with no clue about how to position a boat or hold it on station. Still, we all retired to our “village” for a really nice evening, sharing a barbie and a few beers and having a good laugh. It does seem one of the things about MKRC, that we all get on really well off the water and evenings like this are just such good fun. As a really nice touch, Paula (who’d had to take Jo back to Uni after finishing her races) reappeared with a couple of bottles of bubbly, to toast Sam and Alice’s de-novicing; very well received! We had entered an impressive contingent of ten crews up for the 500m Sprint race on Sunday. We awoke to a similar wind to yesterday, maybe a little lighter, but mostly grey and horrid. Not a nice day for racing, but still. After a quick reshuffle of crews following the brilliant win by the Women yesterday, the crew entered at IM2 swapped to IM3 having just few enough points. in the heat, a strong start and solid row saw Andi, Lindy, Ash and Sam cruise into first place to book a place in the final. First race of the day and off to a good start for the club. From the start in the final, one of the crew missed a stroke and this slewed the boat around; rather than continuing and (probably) getting disqualified, Liz (coxing) stopped the boat, straightened up and set off in pursuit. Over 500m this was too much and although they overhauled one boat, they could only finish a disappointing third. With Nelson not being available, Gwen sat in with Mike in their first race (outing?) together. In the heat, they did enough to finish third, taking them into the final. Racing against more experienced crews, they were going to struggle but put up a really good row. Finishing last but still in contention, a good first race for the two of them. Off the start, they flew off keeping up with the composite and leaving the others in their wake. About halfway, Steve (coxing) called a push, the ladies responded and Steve shouted that they were rowing through the other crew. Paula, used to Steve’s economy with the truth when coxing, glanced across and saw this was actually the case. Pushing again, they seemed to break the other crew and then powered away, to storm to our first win of the day. After the disappointment of the previous day, to put that behind them and take such a big scalp really did give all of us a huge lift. Definitely one of the best performances I’ve seen by an MKRC crew. We were all just getting our breath back for the Women’s win when the next race down the course provided our second win of the day. Yesterday’s W.IM3 4+ boat, rowing at IM2 today clocked up another impressive row and beat off the other finalist from Warwick quite comfortably. Our next boat out, Andi and Liz sculling as a double for the first time, provided our next win. With Andi stroking and Liz steering, they were able to push into a lead and hold it, crossing the line a length clear. Clare and Karen made up this new combination, with Clare steering for the first time in a race. Up against two Peterborough boats and a Champs one, this was a tough final. After an early diversion, Clare got the boat bang on course and they were very much in contention right to the end, but unfortunately finished last. However, an encouraging first race and a big well done to Clare on steering. Next up was the Men’s coxed four. Obviously stung that the ladies had clocked three wins to the mens’ none by this point, they really went for it. A new combination saw Mike, Benn, Tim and Josh involved in a really close race but they had enough to pull through the other crews, to add another win for the club. Given the strength of the opposition (including a composite of Uni kids) this was another very fine performance. With Steve and I drawn against an ominous looking trio of Poplar Blackwell, Champs and Nemesis, we knew this would be tough, very tough, as all three crews have beaten us comprehensively in the past. In the event, the Poplar Blackwell boat didn’t appear (quite funny – the marshals didn’t realise they weren’t there and were getting really stressed at a Warwick double that they thought were Poplar!) leaving us sandwiched between the other two. Despite a good start which kept us up with the other two, their superior ability and power soon told and by 200m Steve was calling to save it for the quad later, as we were so far adrift. Again, really horrid conditions, and I was struggling to cope in these. Benn and Tim were next up, racing their pair. In a close fought encounter, they finished last of the three boats – clearly disappointed, which augers well for them as a crew as they feel there’s a lot more to come..
With Tim having dropped out to row in the pair, Gwen replaced him in the quad from Saturday, with Josh moving to stroke. Our opponents were Peterborough and this turned out to be the crew we’d beaten easily the previous day. From the start, we pushed away from them and were able to control the race comfortably, concentrating on keeping it clean and not making any mistakes rather than on power. Despite this, we continued to pull away all down the course and claimed our last win of the day. What we hadn’t realised was that Josh was still a sculling novice, until he (quite modestly) told us as we were paddling in after the race, so another de-novice for the club. We were all still buzzing from the results while we were packing up when they announced the results of the Victor Ludorum for the day. Normally, this just passes us by as this usually goes to the “big” clubs who put in loads of entries. Not today; to our amazement, Milton Keynes finished <strong>third overall</strong>, a quite spectacular result for the club. It was then an en masse visit to Race Control to get our winning chits and then to the club to pick up our pots. Including the Saturday win, we collected a grand total of 24 pots – as seen below! Fortunately, they had run out of medals for those events held as straight finals, so we all got a proper trophy (to me, medals always seem a bit insignificant). Having packed up it was time to head home, tired, but well pleased with the day’s effort. On the way back to MKRC, the heavens opened as well, so we’d been really fortunate that we’d kept dry (if cold) all week-end. I guess it was the weather with the strong winds causing everyone to get more stressed but, other than our results, I didn’t enjoy this year as much as previous events at Peterborough. Normally, the Peterborough regattas are great, well organised, well marshalled and highly competitive, with loads of competition. This year seemed to be the opposite; we had the really distressing incident with the Women’s crew on Saturday and the some of the marshalling could have been better (holding crews on the stake boats in high cross winds just to avoid starting a race a minute early is a bit too picky) and inconsistent treatment. The entries seemed way down on previous years, with the boat park well short of full (although a certain club did manage to make life very difficult for all by blocking virtually every single access, please think about others!) and the car park not even reaching up into the meadow. A word of praise for Tim in all this – in between racing he was trying to sort out the entries for East Midlands Regatta next week. No sooner had he got everything sorted than one of our crews would win, changing the crews’ point and needing another call to the regatta secretary! Surprised he didn’t tell us all to stop trying so hard in the end! Finally, I’ll return to one of my favourite rants, the craziness of the new BR points system. By winning in a straight final against one other crew, who were clearly way short of us, I pick up another sculling point. As Steve pointed out, one more and it makes me an IM2 sculler – I don’t think so!!! All that is happening is rowers are being pushed into higher levels, where they are just going to act as “cannon fodder” for the better crews. This is demoralising and will lead to people not bothering to race. I know the argument is that not giving points for races with less than four entries led to pot hunting by crews (although I’ve never been aware of anyone doing this) but with all the results computerised at BR, surely there is scope to allow a maximum number of no point wins before giving rowers a point? This could also cover Mixed and Masters events, making it more even throughout. Don’t know about anyone else but I thoroughly enjoyed the Regatta on Saturday. This was only our second ever Regatta and was slightly bigger than last year’s with three other clubs attending (Bedford RC joining Northampton and Oundle). I’m not going to try and write up every event – partly there were too many and (mainly) I was either marshalling or racing so didn’t see half of them. So, I’m just going to pick out some of the highlights (for me) of the day and leave it to others to add their own thoughts. That way, maybe we’ll wind up with a full picture! Unlike last year, held in a dead calm, we had very strong winds and this made for some very challenging conditions, especially at the start.Despite this, we only had a couple of capsizes and no clashes in races, showing a high standard of rowing and sculling by all taking part. I know some crews found the going very tough but everyone battled through. We had some incredibly close races, including a couple where the verdict was one foot! It was good to see the full spectrum of events as well, juniors, seniors and masters, and everything from singles through to eights. We re-jigged a couple of things from last year, firstly the trailer parking, having the trailers in front of the club house. This proved fortuitous as, having parked three trailers neatly, a fourth then turned up – Oundle having so many boats they needed two trailers! We were able to slot them in where we parked the trailers last year, so no real panic. Got to say how impressed I was with the parking ability of the trailer drivers, just wish I was that good. Assuming we expand next year, we’ll have to really think about this one though. Second change was to the boating pontoon – we moved this to the left of the slipway and this did help with congestion along the footpath, although it did mean most crews opted to go off here, leading to some delays. Again, one to think about for next year. The circulation pattern worked better, removing the need to have crews crossing the racing line. Personally, it was an interesting day, staying upright and dry in my first Regatta single scull race (only finished two lengths down, which I was really pleased with), being well and truly thumped in the quad and then finally getting a win at our home event in the double with Steve. For me, some of the highlights were the Open Eight between Bedford and Northampton, one of the closest races of the day, with Bedford shading it at the finish (by a foot) and the Northampton against NSB quad, again a foot in it (with NSB emerging as winners). It was nice to see the pots and medals being spread around as well, no one club dominating things, although our ladies seemed to be putting in strong showings all round. Special mentions for Paula and Lou – first time ever in a double and (despite a scenic route) winning their straight final and to the two beginners crews, who put up a serious fight with only half a length in it, credit to the coaches from both Bedford and MK for getting beginners to this standard! Starts were very difficult and all credit to the Sea Cadets, who did a tremendous job hanging on to the sterns of boats against strong winds, waves and rowers trying to keep on station. Their arms must seriously ache today (and be a couple of inches longer). As an illustration of just how hard this was, one boat managed to dislodge one of the stake boats, casting it adrift (quickly rescued by the safety launch) and another managed to get wedged between the stake boat and the bank, being battered by cross-waves. If you were there, do let me know your thoughts and memories!